Israeli troops on a raid in southern Gaza have called for a mass surrender of male residents in part of the Rafah refugee camp. Reports say army loudspeakers told males aged 16 or over in the Tel Sultan area to gather at a local school or risk demolition of their family homes. Officials are quoted as saying they were after militants, not all males. Troops stormed the camp on Tuesday, killing 20 people and confining residents without electrity or water. Thousands of residents are reported to have emerged from their homes in response to the call, and walked to the school carrying white flags ahead of Israeli tanks. Firing by the Israeli troops continued as the residents gave themselves up, family members said, quoted by Reuters news agency. Tuesday violence was among the bloodiest in three years of Israeli-Palestinian violence - and reports speak of another four deaths on Wednesday, including a 14-year-old boy. The army says it is punishing militants and destroying arms-smuggling tunnels. Several houses belonging to the families of militant suspects have been demolished. International condemnation has mounted against Israel and the US has asked for clarification about its actions. Israel says it only shot at militants on the first day of "Operation Rainbow" although the Palestinian dead included a boy, 13, and his older sister. Witnesses said they had been killed by an Israeli sniper as they gathered laundry from a rooftop - but the military suggested they were killed by a Palestinian bomb aimed at troops. Palestinian medics said a number of the dead from two missile strikes on Tuesday were civilians. The number of wounded had risen to 50 on Wednesday, exceeding the capacity of Rafah's hospital. Palestinian resident said ambulances were having difficulty evacuating casualties to hospitals due to the intense fighting. A 55-year-old resident of Rafah, quoted by Associated Press, said soldiers used two of his cousins as human shields during house-to-house searches. The massive invasion into Rafah camp - one of the largest and bloodiest ever in Gaza - comes a week after Palestinian militants killed 13 Israeli soldiers in several ambushes. Seven died near Rafah. The army says it demolished the home of Ibrahim Ahmed, an Islamic Jihad militant blamed for killing a pregnant Israeli settler and her four daughters on 2 May. 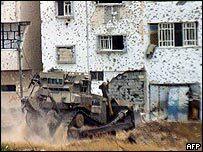 But military officials went back on their initially-declared plan to systematically destroy whole rows of houses along a patrol road where troops are frequently attacked by Palestinian militants. Before the raid, thousands of residents - themselves refugees when Israel was founded in 1949 - fled their homes fearing they were earmarked for demolition. Israeli Prime Minister Ariel Sharon says he plans to pull troops and settlers out of the Gaza Strip, but he hit an obstacle last month when his own party voted overwhelmingly against withdrawal. Government sources say Mr Sharon will present a reworked plan for a phased pullout to cabinet soon. The intense activity in Rafah camp is thought to part of a tactic to avoid making withdrawal from Gaza seem like a defeat for Israeli forces. Residents of Rafah camp, one of the most deprived and long-suffering Palestinian communities, have described terrifying hours spent hiding in their houses since Operation Rainbow began on Tuesday. "There is no water, no electricity, and it is very hard to move inside the house using candles, because snipers in the building next door will shoot you," said 33-year-old mother of four Salwa Abu Jazar, quoted by AP. Saleem Katib said his elderly, sick father has been stuck with other congregants at the mosque for more than 24 hours because of a total curfew. Another resident said human waste was spilling into the streets after the Israelis destroyed a sewage pumping station generator. "I saw an Israeli bulldozer starting to demolish a building as people were still inside. No notice was given," Hassan Abu Yusef told AFP news agency. United Nations representatives in New York have been discussing a proposed resolution to condemn the demolition of houses in Rafah and call for an immediate halt to military action. But the measure, which reportedly had broad Security Council support, was met with a counter-proposal by the US, which usually blocks documents singling out Israeli actions for criticism. Britain has proposed compromise amendments, and a final text may be presented for voting on Wednesday. The European Union has strongly condemned Israel's conduct in Rafah, while US President George W Bush said he was "troubled", but stressed Israel's need for self-defence. Palestinian leader Yasser Arafat said Israel was carrying out a "planned massacre" of Palestinians. "What is happening is an operation to destroy the local Palestinian population, and this must not be accepted, not by the Palestinians, nor the Arabs, nor by the international community," he said. Israeli forces have killed two militants in the West Bank in recent hours, one in Jenin and another in Nablus. 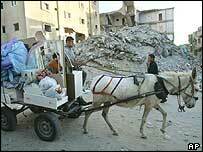 "Fury on the streets of Gaza"